Our flight landed about 30 minutes late, but because of the previous day’s snowstorm at JFK, several of our group missed the flight to Italy. We ended up waiting in the Rome airport for about two hours for others to join from a later flight. Unfortunately, only three of the five made the flight that got them in the same day as us. We boarded the bus and met our guides and bus driver. Our Olive Garden chef, Paolo, was our culinary guide for the trip, taking care of all the local arrangements as we traveled. He spends part of the year conducting these groups and the rest back in the office inspiring new foods. 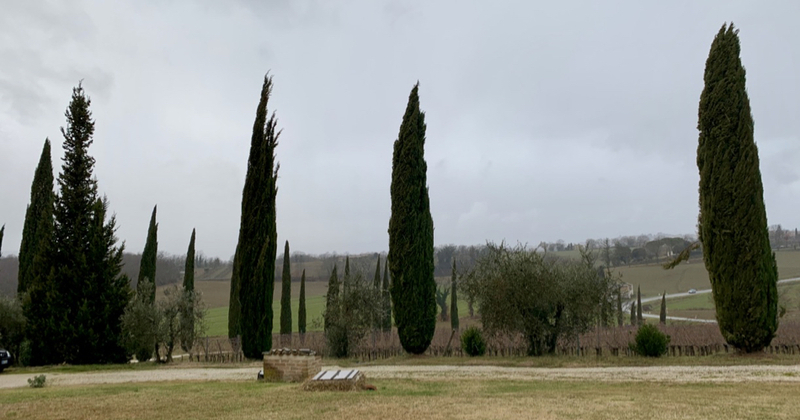 We drove to Sabatino Tartufi, a truffle farm in the countryside outside of Rome. We had a late snack of amazing flatbread pizza with local ingredients and variety. My favorites included a sliced potato flatbread and another made with back of pigs cheeks. A glass of prosecco to toast our first meal in Italy completed the session. We were then off inside the house to learn how to make pasta from scratch. Paulina was our chef and had already made the dough, so we simply had to roll out, cut and prepare for cooking. We enjoyed a second, larger meal with the fresh pasta and a spread of various meats, cheeses and items accented with local truffle. The truffle honey was by far the most incredible of the truffle dishes we tried. Evening fell and we continued our drive to the ancient city of Perugia. We quickly checked in at our hotel, freshened up, then took an evening walk of the old fortress within the city before dinner at the hotel. Dinner included a puff pastry, stuffed pasta, veal, and a gelato for dessert. I was so full and had amazing conversation getting to know a few of our fellow travelers. I consider the service of this particular meal to be the best of the trip. Ask for nothing. Everything there before you needed or wanted it. The food, wine, preparation was fantastic and worth the wait.